In today's post I'm going to be talking about a new brand I've recently discovered sitting on the shelves in Wilkos. A few weeks ago I blogged about Wilkos' new beauty range, and amongst the gorgeous brushes I found, I also discovered a brand called 'Essence'. I'd never previously heard of the brand before, but a quick look on their website suggest they're available all around the world. 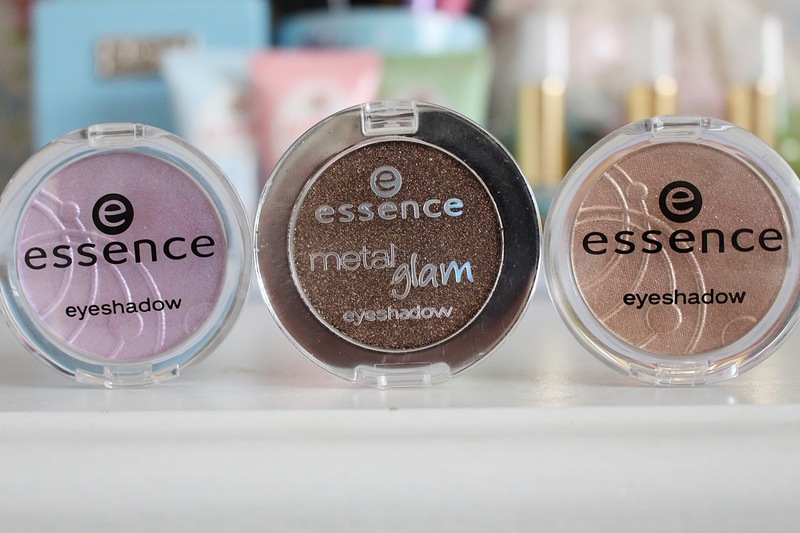 Whilst in Wilkos I spotted a stand full to the brim of Essence goodies, and after originally giving them a wide berth, I tried a few testers out and was immediately sold. On the stand there was everything from nail polishes to blushes, eyeshadows to eyeliners... and everything was ridiculously cheap. Luckily for me it was all three for two as well, so I couldn't resist picking up six different bits - three eyeshadows and three nail polishes. The nail polishes had me seriously excited as soon as I laid eyes on them - I'm a sucker for a cheap nail polish, and the best thing was that a great deal of the polishes available were glitter-based or 'effect' polishes. 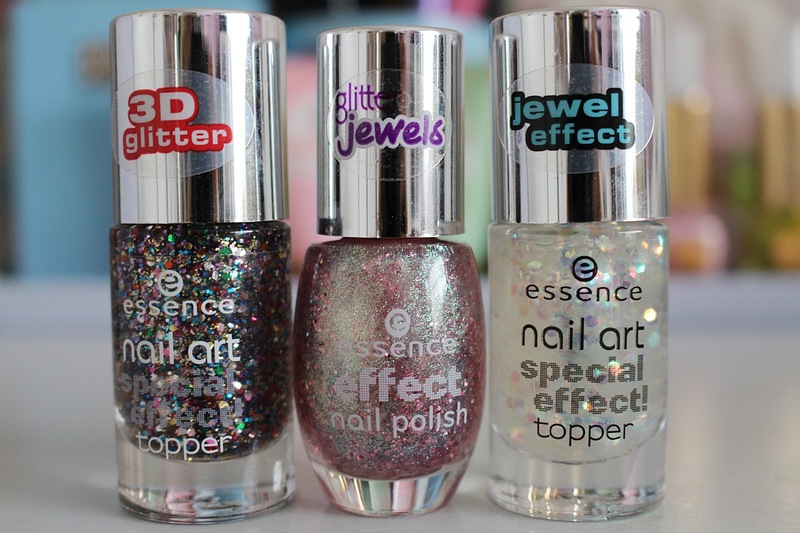 The three I decided to go for in the end were two 'Nail Art' Special Effect Toppers; 'Circus Confetti'; a multi-coloured mix, and '23 Million Dollar Baby'; a stunning jewel-effect, and one Effect Nail Polish; 'Glitz and Glam'; an sparkly pink with iridescent turquoise running through it. In short - these polishes are fantastic. As you can see from the images above, they are completely stunning and unlike any polishes I've seen before. Well, I tell a lie, I do think I've seen lots of polishes similar to 'Circus Confetti' before, but as for the two other polishes, I don't think any other brands have achieved similar effects as yet. 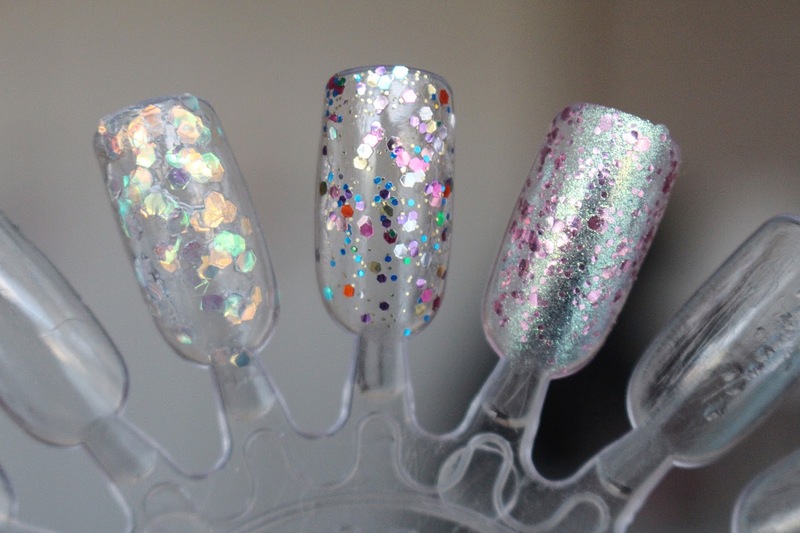 'Glitz and Glam' and '23 Million Dollar Baby' are absolutely gorgeous, almost mermaid-esque nail polishes. '23 Million Dollar Baby' almost looks like sequins on the nails, whilst 'Glitz and Glam' is a really beautiful mix of pink flakes with iridescent green/blue running through it. As for staying power? I've found these polishes last amazingly well, with no chips at all. They're also really easy to apply and to be honest I can't fault them at all. The eyeshadows definitely aren't as exciting as the polishes, but they're still worth mentioning. I was drawn to them as from swatching they seemed fairly pigmented and for the price I couldn't grumble. 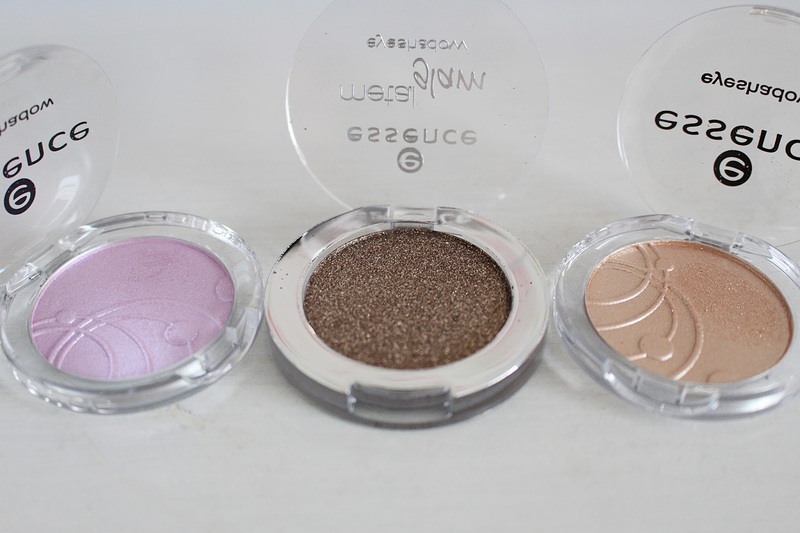 However, upon application there really isn't much to be impressed about when it comes to the 'Mono Eyeshadows' - they look pretty but take quite a lot of work and aren't nearly as pigmented as I originally thought. I opted for 'Purple Clouds', a lilac-toned shadow, and 'Dance All Night', a pale beige from the Mono shadow range. However, the eyeshadow I am impressed with is the super sparkly deep brown/copper shadow, 'Chocolate Jewellery' from the 'Metal Glam' range, which is really pigmented and super sparkly. I'm definitely keen to try more of the 'Metal Glam' shadows after trying this one. Overall I'm really impressed with Essence as a whole. I think Wilkos have done really well to secure this brand in their stores as it is bound to be really popular, particularly with younger girls starting out in makeup. I'm wishing I'd given the blushes a try as opposed to the shadows as they had some really interesting gradient blushes, but I'm sure I'll get round to trying them soon. I can't remember exact prices but everything I've mentioned cost around £1-£3 each - so really affordable. I'm keen to try more of the polishes as they seem to have quite a range of different 'effect' lacquers and for the price they're definitely worth it. Have you tried Essence yet? What do you think to it?